G protein-coupled receptors (GPCRs) constitute the most versatile superfamily of biosensors. This group of receptors is formed by hundreds of GPCRs, each of which is tuned to the perception of a specific set of stimuli a cell may encounter emanating from the outside world or from internal sources. Most GPCRs are receptive for chemical compounds such as peptides, proteins, lipids, nucleotides, sugars, and other organic compounds, and this capacity is utilized in several sensory organs to initiate visual, olfactory, gustatory, or endocrine signals. In contrast, GPCRs have only anecdotally been implicated in the perception of mechanical stimuli. 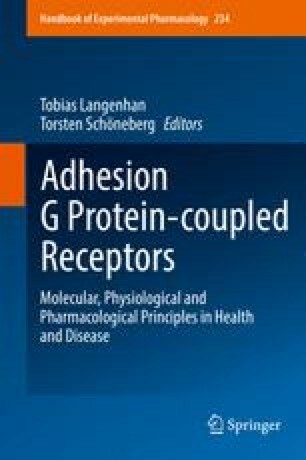 Recent studies, however, show that the family of adhesion GPCRs (aGPCRs), which represents a large panel of over 30 homologs within the GPCR superfamily, displays molecular design and expression patterns that are compatible with receptivity toward mechanical cues (Fig. 1). Here, we review physiological and molecular principles of established mechanosensors, discuss their relevance for current research of the mechanosensory function of aGPCRs, and survey the current state of knowledge on aGPCRs as mechanosensing molecules. The writing of this manuscript was supported by grants from the Deutsche Forschungsgemeinschaft to R. J. K. and T. L. (Research Unit FOR 2149, Projects P1 [LA 2861/4-1] and P3 [LA 2861/5-1, KI 1460/2-1]; SFB 1047, Project A5; SFB-TR 166 Projects B4 and C3; LA 2861/7-1). K. R. M. acknowledges support from the NIH (R01 NS079445, R01 HD080601).